Shirobako is an anime about a "shirobako" referring to the white box into which a finalized tape of a film is put, full of the effort of everyone who worked on it. Five girls have their eyes set on getting in a white box as they try to find success in the anime industry through writing, production, and voice acting. From P.A Works, Shirobako has awesome animation that won't disappoint. This anime is directed by Tsutomu Mizushima who directed many other works such as Another, Girls and Panzer, and Squid Girl. With Michiko Yokote doing the series composition and Pokan8 doing the character designs. 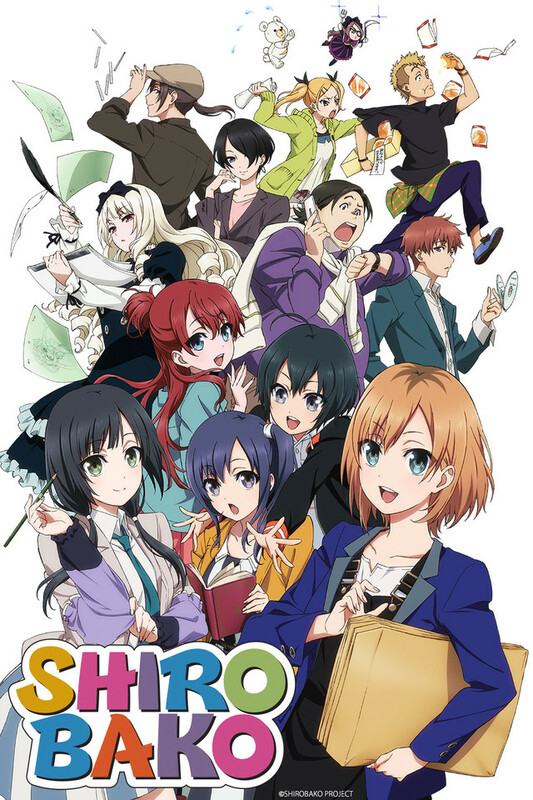 Shirobako is a comedy and slice of life anime about cute anime girls making animes about cute anime girls. That's a win win. Now, Shirobako may be boring to many other people but it's very interesting to others. I myself find it a white box of mysteries that shows how animation studios make anime. It makes you respect anime studios that get low pay but still want to make these animes for other people to be happy. Shirobako is a 5 out 5 stars because it does what it's suppose to do. Tell the people watching what people have to go through to make anime. You should respect these people. Shirobako has to be one of the biggest surprises for me. The slice of life look into a somewhat idealized anime industry setting is a treat on its own but what makes the show really shine is the exceptional characterization done for the lead character Miyamori Aoi. Miyamori-san is constantly put into high pressure situations where she simply must deliver results or the show is going to go off rails. I simply love that the program shows her wrestling with complicated choices, murky situations that demand quick results, and realistic professional angst. Miyamori-san is a very likable character and I appreciate authenticity the shows brings to her. Overall, the show is set up in a somewhat cliched fashion with a sort of 'crises of the day' approach that must be solved. In this instance however, I think it really works because creative production is often a 'crises of the day' endeavour in real life as well. The show is not afraid to speak about real and current issues in the industry in their episodes. I found the 3D vs. Key Frame animation episode to be extremely well done and it excelled at showing both sides of a complicated issue. A surprisingly touching moment for me comes at the very end of the episode. After having seen the 3D version of a scene earlier they showed the 5 or so seconds of the same scene using Key Frame animation. It's a moment that passes quickly and in complete silence but the artistry on display was very moving. I finished the episode with a renewed appreciation for the dedicated and talent on both sides of the argument. The show is not above lampooning certain aspects of the industry and anime tropes in general. The conversation around the definition of 'moe' was absolutely sublime. The farther along it went the less it became defined until at a critical there is a literal moe explosion with the light of moe keening out into the night. While the show does maintain a strong foundation in reality, these little scenes and nods to the culture of anime and the process of creation serve as useful (and entertaining) visual metaphor. At the time of this review the show is 13 episodes into the 24 episode season. I am very much looking forward to seeing how they will wrap up the series and suspect and hope that we will see the animation clubs reunion. I simply cannot recommend this show enough. I normally watch anime with cyberpunk/mecha/serious themes and decided to give this a chance since the setting was so unique. It has made me appreciate what goes into the creation of the shows much more as well as expanded my own anime horizons. While it is doubtful anyone involved with the creation of the show reads random reviews in english, I would just like to thank them for their work and I wish great success with Shirobako and their future endeavors. Ever wonder what making anime is like? This gem will explain. Shirobako takes viewers on a ride through the anime industry with the help of five young girls that use their determination and cuteness to keep us entertained. This anime is largely a drama that goes into the daily life of making anime and overcoming problems that arise along the way. Our heroines are just normal people that love anime and are working in the industry with differing goals and working in different areas. If you are curious as to why some anime randomly have recap episodes or a large drop in quality this will also give a lot of insight and understanding into just how much effort is put into every episode and how close to deadlines things can really get. The series is very light-hearted and tends to be a great casual show to watch for myself. As I've completed the series now I can only recommend it as it was very entertaining all the way through. By the end of the show I was rooting for the entire cast of characters as they are a very fun bunch to watch and despite their flaws make me want to root for them. I find myself less and less interested in the interminable techno-fantasy sagas these days; they just don't seem to have much to say. Discovering 'Shirobako' was a delight. I love the fact that you see EVERYTHING, from the production team's color-coded spreadsheet to the arcane Windows software used by the colorists. There's such palpable love and care in this series; a clear sense that its producers wanted to do something different, something special. All in all, it's one of the best depictions of collaborative, creative work -- of any kind -- I've ever seen. I've been watching anime for a while and don't have any particular genres I'm totally into. And then, I heard about Shirobako which is an anime about making animes. What better way to learn about the 'behind the scenes' moments of anime production. In short, this show really bulldozed my initial thoughts on producing anime from scratch to its finale. To learn the many roles, within the many departments, needed not just to make an anime but one with quality, was truly enlightening. Just like any company in most fields, there are a plethora of roles/specializations that keeps an organization running. For instance, in the arts department, you have the coloring section, the key animators, character designers; which completely broke down my perception of an arts department being just drawing. There is a wonderful feeling when you get to see the step-by-step procedures undertaken to bring static drawings into living-like motions. I can only imagine how it feels for the artisans themselves to witness the magic unfold. Now, I definitely have a greater appreciation for the unsung, underpaid heroes behind the many awe-inspiring stories in the world of anime. Besides that, one particular theme that kept circling my head throughout watching this series was everyone's collective interest/passion for anime, and how passion transcends age/time. It's great to see the experienced professionals nurturing the younglings into the field and I can only hope that a similar magnitude of encouragement applies in reality as well. Moreover, this anime was not about some smooth-sailing ride. It portrays the reality of work environments quite accurately, with human factors being a huge deterrent in getting work done, and deadlines being very stringent particularly when dealing with clients. There was a good dose of pressure felt by the characters as they embark on their journey into the 'reality' of the anime production world. With that said, the character development for Ema and Aoi stood out for me. Ema, being an underconfident and rather shy individual at first, gradually becomes more assertive and a risk-taker with support from her fellow colleagues, and eventually begins to nurture Kunogi, her kouhai. Then there is Aoi, who was very focused on dealing with the clear goals right in front of her, eventually having doubts of her future long term goals, particularly a target role in the industry. However, being in the production line where she gets exposed to all departments, she gets to observe, interact and intertwine the various departments into working in harmony. Thus, I believe the endpoint of this series for Aoi was appropriate. All in all, there were 'funny story's throughout the series which added to the lightness of this casual-paced show. With that, I will give a 9/10. A big thank you to P.A. works for a great job on Shirobako. Hope to see more great stuff soon! Watching SHIROBAKO has been an absolute pleasure, and I feel like I did when I first started watching anime. I'm not sure why I'm getting nostalgia; perhaps it's the novel idea they decided to go with? Most likely. Anyway, P.A. Works' last anime, Glasslip, did not capture me at all, yet reading the premise of the show I decided to give it a go and I can say, even though I'm only on episode 7, that I do not regret it! I feel that they truly capture the spirit of the industry they work in, and I definitely enjoy the play-within-a-play idea of anime being developed in anime. The characters are silly, but in a way that makes them interesting. And it's super helpful to have their name and title pop up frequently, as there are so many characters to remember, but whenever I hear their name now I begin to remember them. I'm not sure how long this will go on for, and I won't beg for more than a 12- or 13-episode series, but multiple seasons would definitely be appreciated. I would like to see where the characters go in regards to their occupation, and any dreams or goals that they set in the series. I'm definitely excited to watch the rest of the episodes that are out, and I definitely recommend this anime to everybody who enjoys a proper slice-of-life. An essential watch for any anime fan looking for a behind the scenes look at the industry. If you're looking for the dark horse of the season look no further. Stressful all-nighters, deadlines, working with sub-par employees, hesitation, and finding one's true self are just a few aspects of the anime industry that are brilliantly portrayed in Shirobako. The show does an exceptional job of working through the development and contributions of its large cast of characters who all have their own strengths and weaknesses that they must overcome in order to complete the company's new project, Exodus, on time. P.A. Works once again shines in the animation department as Shirobako is as gorgeous as you can make a show that mainly focuses on a work setting. Don't let the description of Shirobako fool you though, there's still a comedy aspect to the show as life can't always be all work and no play. If anyone wants a deeper understand and appreciation for the anime industry, Shirobako is a must watch. Enjoyable so far, looking forward to more episodes. I was interested in this series because I was keen to see how anime is created. It's great to understand how much time and effort goes into each episode, because as the audience, we only ever see the outcome of the production team's hardwork. So far, the series has been able to show the BTS procedures and the stress associated with it. It's down to earth, funny, and not at all your typical series. The cast is also very likable and I look forward to this being my replacement for Nozaki-kun this season! Shirobako's voice acting is great and animation is well done. Introducing every character and what they did in the studio is great but felt rushed, just my opinion anyway. The anime is definitely an easy watch if you something just to watch or relax too. Definitely interested on how it will develop and keep us hooked.